Having rough patches of skin on some of your body parts could be an unpleasant experience. Although these rough patches of skin caused by keratosis pilaris are not harmful, you might find the need to do something to get rid of it. Keratosis pilaris is a genetic skin condition that is brought about by keratinization. This simply means that the protein or keratin that is metabolized by the body and finds its way into the skin's inner layers form keratin plugs that hamper the hair follicle's way through the pores. When the pores are clogged, it results in folliculocentric keratotic papules. 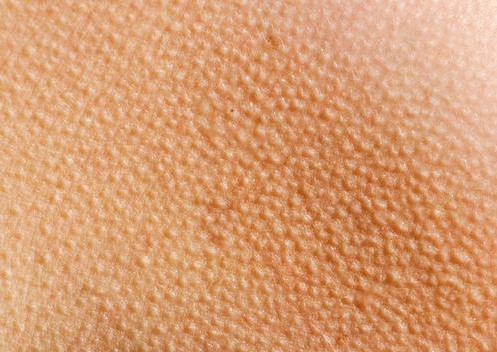 In ordinary language, these papules are referred to as chicken bumps or goose bumps. These are not contagious or medically dangerous. No other complications have been found to be caused by these papules. In fact, the appearance of these papules is often observed to dissipate through the years beyond adolescence. In some rare cases, these papules reappear later on in life but are nothing more but unsightly or unpleasant skin texture. 1. Olive oil and sugar exfoliant - Mixing equal parts of olive oil and sugar can give you an effective exfoliant that you can use in order to slough off the keratin plugs as well as other dirt particles from your skin. 2. Salt and water scrub - Mixing salt with water can also be an effective exfoliating formulation. Gently scrubbing the skin with this formulation can also help clear keratosis pilaris. Be careful, though, not to scrub vigorously as this could further damage your skin. 3. Vitamin E oil soak - Adding several tablespoons of Vitamin E oil to your bath water could help seal in the moisture in your skin and improve the appearance of your keratosis pilaris. Soak in this Vitamin E oil infused bathwater for about twenty to thirty minutes. Do not bathe or shower too long as you can strip your skin off too much oil and cause more dryness and irritation. 4. Apple cider vinegar wash - In some cases, using apple cider vinegar to wash the area affected by keratosis pilaris could take the place of using lactic acid washes and creams. Sometimes, products containing lactic acid could irritate the skin. This natural wash could serve as a more effective alternative. These are just some of the natural remedies for keratosis pilaris. Although there is no real cure for this skin condition, these natural remedies as well as others that may be recommended by dermatologists and skin doctors could serve well in trying to improve the skin's appearance and texture. Keratosis Pilaris is a skin disorder which can affect people of all age groups. Keratosis Pilaris Herbal Treatment is to soften the bumps. Swollen and reddened bumps on the skin are symptoms of Keratosis Pilaris.